A beloved Harvey classic returns! 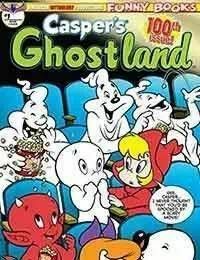 Caspers Ghostland ran for 98 issues from 1958-1979 and there was one Harvey special in 1992 making this the 100th issue ever! All of your favorite characters are here - Casper, Wendy, Hot Stuff, Spooky, The Ghostly Trio, Nightmare, and more! Casper and Hot Stuff discover forest creatures using some salty language in From Bad to Curse, and Casper discovers Spookys weakness in Blow off Some Scream, both illustrated by Eisner Awards-winner Eric Shanower!